I decorated the pouch using the Treat Label Die (also from the last release) followed by the Scallop & Stitched Circle Die and then the Bunch of Stitched Doily Dies. The sentiment is stamped with Teeny Tag Greetings stamp set. I added a teeny heart from the Stitched Sweethearts & XOXO Dies and finished with tying on some fun peppermint stick Trendy Twine. I filled each of them with yummy chocolate, caramel candies. I created matching little cards to go with the pouch. The card base is 3 x 3, then a base layer which is the Stitched Square Dies Inside and Out. I layered the hearts that is from the Heart 2 Heart Love Frame Dies. The XOXO is from the Stitched Sweethearts & XOXO Dies. I finished again with a cute little bow with peppermint stick Trendy Twine. Sweet Valentines! Thanks for sharing at Pause Dream Enjoy Linky Party! These are so gorgeous, Sherrie!! I love the way you decorated the adorable treat pouches!! 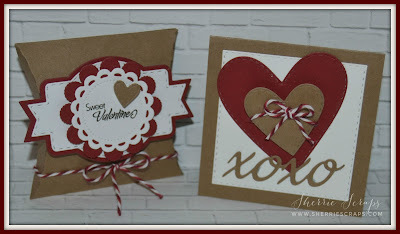 The red and white on kraft is gorgeous!! And the matching cards are so sweet!! What perfect gifts these are!! Your coffee buddies will absolutely adore them!! Thank you so much for playing along at DL.ART!! These are such sweet treat pouches and cards! What a fabulous Valentines treats and cards!! Your coffee buddies will love them!!! Thanks for joining us at DCD this week! Thank you for joining my DL.ART Thankful Thursday Anything Goes FEBRUARY Linky Challenge. Have a blessed day and I hope all is going well. Oh my goodness!!!! These are great!! Thanks for joining us at Die Cuttin Divas this week! Loveeeeeeee these! LOVING all the hearts!!!!!!!!!! Omg! Super pretty. Love them. These are so cute whoever gets them will love them!! Sherrie you have nailed it with these, gorgeous colours and I love the treat boxes. Oh these are just perfect! I LOVE LOVE LOVE that pouch die, it's so FUN! Fabulous!! Your coffee friends will love these! I've always loved the look of kraft and red! I love how you always make a card and a gift. These are so pretty. Adorable treats! I love the kraft and red color combination! The hearts on those adorable doilies create the perfect embellishments! Fabulous treats ! I love them all ! 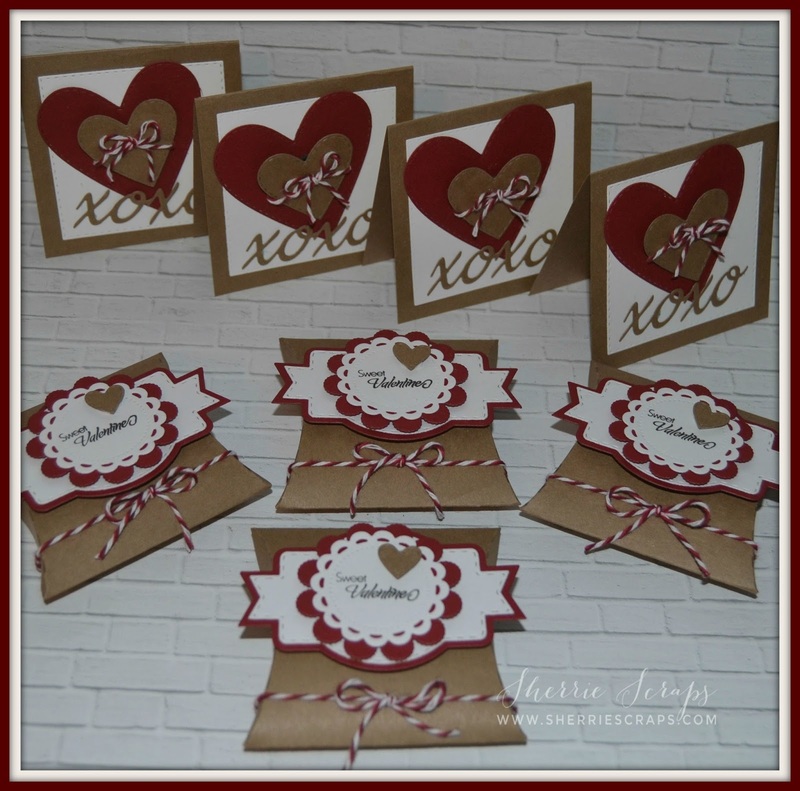 I love the cute pouches and adorable mini cards.I love the kraft & red!! Awesome job my friend!! You ROCK! These are wonderful !! Perfect colors and design Sherrie ! These cards and matching pouch are so sweet!! I love kraft with reds - so pretty! Such cute cards and treat pouches.Love the design. Now I want to make 3x3 cards! It is that time of the year when love in all its forms and types is celebrated. Yes, it is Valentine’s Week, starting from February 7 to February 14. Especially around this time, happily-in-love couples make the time and efforts to make their loved ones feel special. They mark the day by exchanging gifts and spending quality time with each other. Building up the hype of Valentine’s Day are the seven days that come before — Rose Day, Propose Day, Chocolate Day, Teddy Day, Promise Day, Kiss Day, Hug Day — in that order before the big V-Day comes a-calling.